The Christmas List is an app created by Limbua.com. It costs $1.99 and is available on the iPhone, iPad and iPod touch. This app lets you track multiple groups which you have to buy presents for, as well as individual people. For example: you could have a family group and a co-workers group. In the family group you could setup a budget of $700 for your sons’ gifts. From there you could also add the exact gifts you want to buy him, and the stores from which these gifts need to be purchased. After you have added gifts for each person you want to get presents for, you can see your budget left for them. Not to mention that you can also mark each gift as purchased, wrapped, shipping, to do, and received. When you’re at the mall or at a certain store, you can take out this app and it will let you know which stores you had to buy each gift. It certainly makes life easier using this app, because when you’re at Walmart for example you’ll know exactly what you need to buy from there. 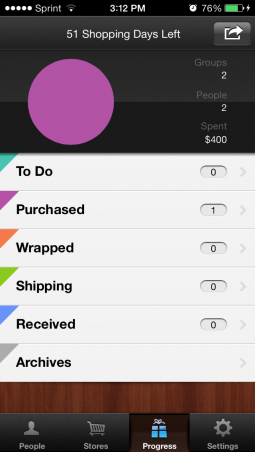 This app makes it easy to budget presents over the year, so you aren’t surprised when Christmas comes up. Even months before Christmas you can create budgets for people that you want to buy presents for, and start saving up early. The Christmas List can also be protected using a passcode, so no one finds out what you’re buying them when they shouldn’t find out! You can even assign images to each person you’re buying gifts for, so this app is definitely intuitive. It would be really cool if you could create a wish-list using this app and your contacts could see what you want to get for Christmas. Of course this is almost such a big feature that it would be an app within itself, but still a good idea. You probably spend more than $500 on Christmas gifts each year, so it’s pretty easy to justify spending $2 on this app that makes life easier.